I seem to have only been like a boy playing on the seashore, diverting myself in now and then finding a smoother pebble or a prettier shell than ordinary, whilst the great ocean of truth lay all undiscovered before me. Putting more space between tonight and my recent illness, I am finding a renewed delight, tinkering with watercolor projects. The shock of discovery is returning, and I feel like a small boy again, oftentimes my eyes widening with suprise at what comes out of the end of my brush, or what pools up on the watercolor page. And all the while I work on this watercolor, I feel ecstasy in knowing that I am a part of an extensive tradition, an endless line of creative spirits. In the stillness of this studio, I work while listening to the voices of Robert Motherwell, Willem De Kooning, Andrew Wyeth and Joseph Campbell on the VHS and DVD documentaries that I have stockpiled over the years. I love being a part of something much larger than myself, something much larger than this moment. I sense an immortality in all of this. I have read, over and over again, Julia Cameron’s work The Artist’s Way. Writing from her Upper West Side Manhattan environ in that day, she pushed out these words: “Artists toil in cells all over Manhattan. We have a monk’s devotion to our work–and, like monks, some of us will be visited by visions and others will toil out our days knowing glory only at a distance . . .” I love the sanctuary feel that floods my studio space in the night when things get quiet and I have only my thoughts moving about as I bend over the watercolor and explore its dynamics. There is so much waiting to be explored, that I keep coming back to Newton’s testimony that the small boy turns over pebbles while the ocean of truth waits beside. ART STILL HAS TRVTH. TAKE REFVGE THERE. These immortal words of Matthew Arnold are chiseled over the portal of the Saint Louis Art Museum. I have read them on repeated visits to that “cathedral of art.” And I take them to heart tonight. My working art space has become the cleft in the rock, the shelter from the storm, the safe haven, my refuge. Life has had its difficulties lately, but I’m grateful for sanctuary this night, for the quiet hours to pursue art, while outside the temperatures continue to drop and the rain continues to fall. In a traditional school setting, intensity is dilluted by short and widely-separated class meetings, continuity is lost as everyone scatters to the winds at the end of each class period, and ideas dissipate before they ever fully develop. Throughout my years, I have wrestled with this reality. As a graduate student, when ideas moved me profoundly, I found myself frequently scrambling to assemble my scattered, fractured thoughts into some kind of order and save them in such a way that they would not disappear between class periods, or while sleeping at night. I never found a “system” for organizing all that knowledge. Years of teaching school since those days have only added to the mix. Students stimulate me daily with new ideas, alternate vistas, novel perspectives, and every time the bell rings and they sail out the door, I find myself reaching for the journal and trying my best to record the snippets of thought as the next class files in with their new packages of words and ideas. This evening, while working on a commission, I continually found myself stopping in the middle of a brushstroke, drawing out the journal and recording yet again. It never ends. I suppose I have recovered from my recent illness. I’m thinking again. Painting again. And smiling again. Maybe some of these things will assemble themselves into something sublime. I can always hope . . . Thanks for reading. Once this commission is completed, I’ll hopefully get some new paintings back online to share. After seventy-three years, I can still make an awful picture. After seventy-three years, I am just beginning to learn the rudiments of painting. I would like to live long enough, but I think it would take till the 21st century to have something of a sense that I know how to paint. Good evening. This blog post is in response to Corey Aber, an artist-writer-blogger who commands my highest respect. You can check out his work at http://coreyaber.wordpress.com/. 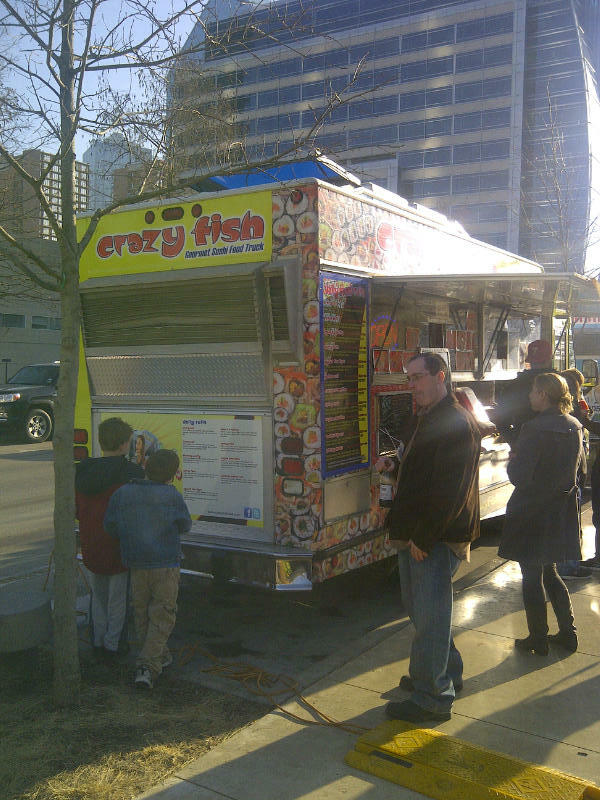 Corey recently asked me to post information concerning the equipment I use in my art making. I’m always glad to share this information. 1. My paper is D’Arches cold press. I buy sheets of 300-lb. to cut to whatever size I choose. I also buy the blocks in 140 lb. measuring 10 1/4 x 14 1/8″. I don’t like the price, and also don’t like the way the paper starts pulling away from the block by the time I get to the last five or so sheets. But it is a convenient tool for packing about when I’m working en plein air. When I am ambitious, I love to soak 140 lb. sheets and stretch them on canvas stretchers, using a staple gun. I love the tight drum-like quality of the dried out paper, the springing sensation I get when I brush on the surface, and how fast it dries when I’m working wet-on-wet. But it is a pretty good chore stretching it, and I have to be in the mood. 2. My pigments are Winsor & Newton. They are all I use. And my palette is extremely limited now. 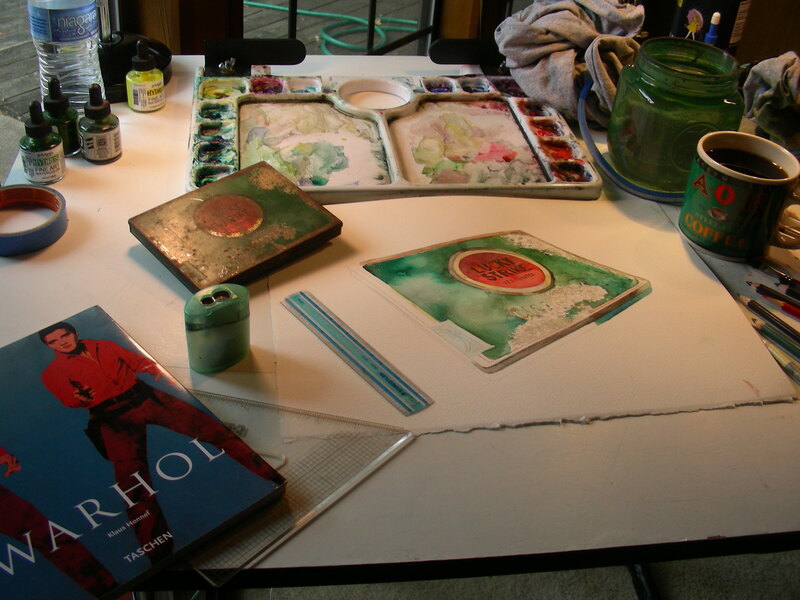 I use three blues–Winsor Blue (Green Shade), Winsor Blue (Red Shade) and Phthalo Turquoise. I use only one yellow, Transparent Yellow. And I use three reds–Winsor Red, Quinachridone Red, and Permanent Rose. Occasionally I use Winsor Violet, to tone down the Transparent Yellow. And I use Winsor Green and Alizarin Crimson to mix my blacks. That’s it. The reason for the colors mentioned above is the transparent, clean quality they have when mixing. I can get the best greens, oranges and violets from those combinations. And all my neutrals come from these colors. I ceased using colors such as Sepia, Burnt Umber, Burnt Sienna, Yellow Ochre, etc. years ago. 3. My favorite all-around brush is a Winsor & Newton size 12 Sable Round. It holds a great deal of water, and the tip can be made razor sharp for grasses, detail lines, etc., and I don’t have to keep reloading the brush because of the quantity of water it holds. I also use a couple of flat brushes, sable, Winsor & Newton. 1/4″ and 1/2″. From Bob Cook, I learned to make an “ugly brush” for foliage and drybrush rendering of weathered wood and tree trunks. This is a quality 1/2″ flat brush (Winsor & Newton) that I cut diagonally with an X-acto knife, then shredded out plenty of bristles to create a jagged, ragged brush. This makes very, very fast work of foliage and textures in drybrush fashion. 4. 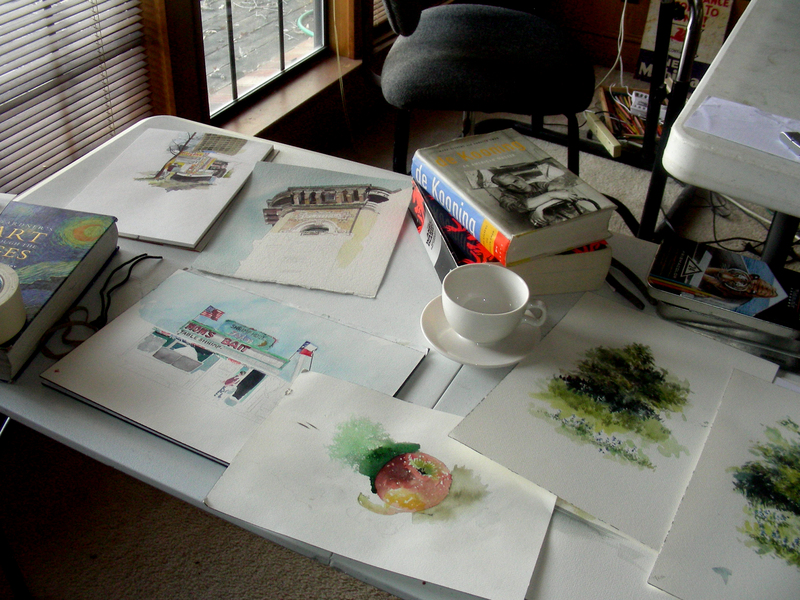 I use a few watercolor pencils that I keep sharpened, and drag a wet brush along them to dissolve the hard line. These are Albrecht Durer pencils manufacted by Faber-Castell. I like to use Dark Sepia, Warm Gray VI and Cool Gray VI. I also keep sharpened HB pencils around, as well as water-soluble graphite pencils in HB and 8B. That’s about it. Thanks for reading. And thank you, Corey, for asking. No one can get anywhere without contemplation. Busy people who do not make contemplation part of their business do not do much for all their effort. For anyone who reads this, I greet you on this Sunday afternoon, wishing you the best of all possible days. I’m happy beyond words to shed the last of my lingering frailties from my recent week-long illness. I did manage to get back to class the last three days of this past week, but felt wiped out after the first class of each day. It has taken so long to feel fully functional. Currently I’m working on a commission promised some time ago, and don’t feel comfortable posting the in-progress work online. I will probably post it when it is completed and delivered. I finally got down to business on it yesterday, meticulously drawing out all the details (it is an architectural piece). Today I am chipping away at it, waitng for momentum to catch. So far, it isn’t happening, but I’m patient, feeling good and confident. The movement will come when it comes. Meanwhile, I’m alternating my concentrated painting and detailing with readings from Robert Henri, scribbling in my journal, and just thinking in a relaxed mode. Outside I can see the bright sunshine and a day building toward 70 degrees, but I don’t feel the compulsion to leave the work table and dash outdoors. All this has been good. I am just grateful to have a full weekend without scheduled engagements. 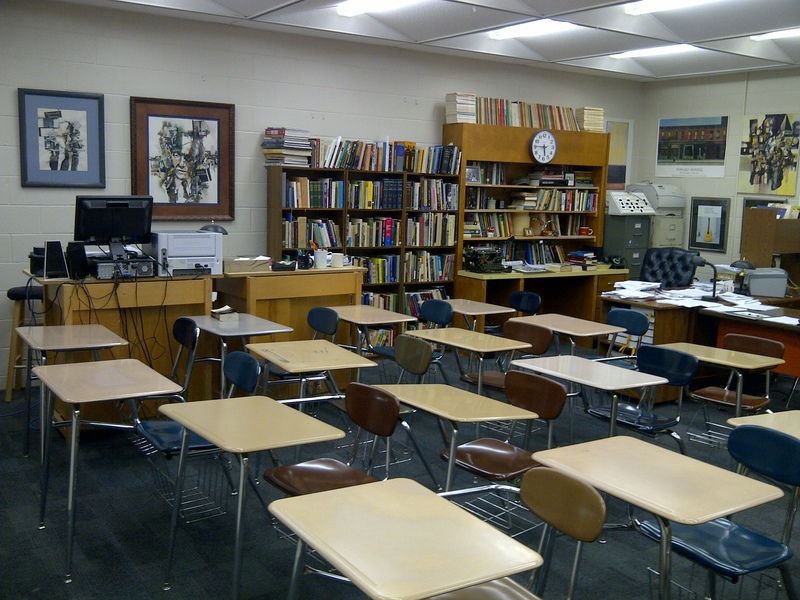 I posted a photo of my classroom, because this year it has been a beautiful place to spend my workdays. No doubt I have posted in the past much grousing on this blog about the wingnuts, details and paperchase deadlines constantly flung at us teachers, but I don’t want to give the wrong impression–every class this year is filled to overflowing with beautiful, eager, receptive young minds, and they have been my life’s blood through an otherwise impossible and difficult school year. As long as I am surrounded with intellectually hungry students, then the real joy of education blossoms daily, and I do indeed enjoy the teaching, the interacting. I always have. I wanted to post the Henri quote about contemplation, because that is at the heart of my lifestyle when I am at my best. Granted, I often tilt to the sedentary excessiveness, and do not find delight in that. But when the thinking is good, the reading is good, and the writing is good, I enjoy life to the max, and I am deeply grateful today for the space to pursue precisely this. I like to consider the composting metaphor alongside the contemplative posturing. “Composting” I got from Natalie Goldberg’s Writing Down the Bones. She writes of our life experiences forming an intellectual compost heap over time, a veritable rich source for writing and expressing our sentiments artistically. Throughout my life, I have drunk deeply from the springs of theology, philosophy, literature and art history. In the spirit of Robert Henri, I have stuck with the call to “join no creed, but respect all for the truth that is in them.” And at this stage of my life, I am still combing through these treasures, searching for some kind of style, some sort of meaning, some kind of artistic identity, not for the museums, not for fame, not for wealth, but simply for the sake of accomplishing something sublime while I’m living out my life on this planet. Responding to the call of Nietzsche’s Zarathustra, I want to create something beyond myself, something much greater than myself, as all generations of creators before me have managed to do. I don’t want to be the first stage of an ebbing tradition. Whitman wrote that “the powerful play goes on” and we are invited “to contribute a verse.” I just want to make a contribution that matters. I return to this Emerson statement every time I catch myself wishing I didn’t live in the suburbs of Arlington, Texas. As a watercolorist, I have wished I could make my home in the Colorado Rockies, New England, the rolling Midwest–anywhere but in a Texas metroplex choked with streets and suburbs. I deal with these feelings now as I look through my photo files and pull up the Hermann, Missouri visit last Christmas season. 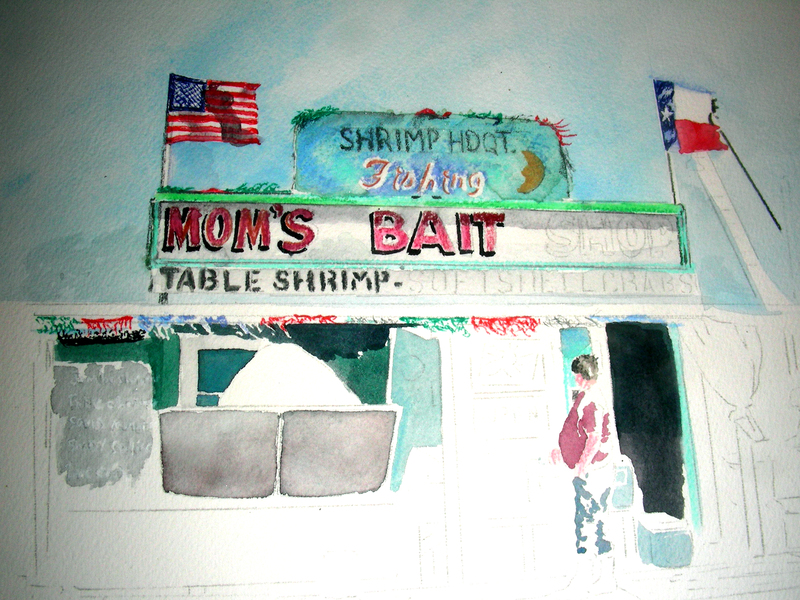 I have decided to tackle one of the old downtown street scenes again, on a much larger scale than before. This afternoon, I took a walk through my own suburbs after lunch, trying to regain strength lost during the past week’s illness. And the longer I walked, the more aware I became of how weak I am currently. I suppose it’s going to take some more days of walking to retrieve that sense of vitality. But as I walked, I recalled the Hermann downtown that I loved so much when I strolled it at the end of last year. Granted, the temperatures were frigid, but the colors were strong, and the winter light so beautiful to my eye. I don’t pretend to have the French Impressionist skill of capturing atmospheric effects, but at least as I work on this, I can recall the scintillating beauty I knew that day as I walked the town high above the banks of the Missouri River. At my current age, I realize fully that these notions of mine are Arcadian dreams. I doubt that Colorado or New England folk would rather be living in Arlington (unless they think there’s pizzass to sharing a city with two professional sports stadiums). But I also know that living in those regions would not make me any more of an artist than I am at this point. I’ll continue to relish opportunities to see vistas firsthand and render them en plein air. But when that is not possible, I still have my photographs and memories for reference. And the later Edward Hopper painted less from “the fact” and more from his memory and imagination. It worked for him. I’m confident it will work for me. I just love this Hermann, Missouri vista, and felt genuine joy in the waning moments of this afternoon as I worked in my studio. The fading light slanting through my studio windows fell on this watercolor page and gave me the atmosphere I wanted for working on a winter scene (this afternoon in Arlington was dark and wintry-looking outside though the temperatures remained high). I picked up the large brush again and enjoyed blocking in large areas of wash. As for the details, I was in the mood for tedium, for tight, exacting work. My eyes are finally comfortable with focussing. It’s seemed such a long time since I’ve been in this zone. I hope I get some more opportunity tomorrow. I don’t like to work in bounds, because when I’m falling, I’m doing alright. When I’m slipping, I say, “Hey! This is very interesting. '” It’s when I’m standing upright that bothers me. I’m stiff. As I limp my way back into the blogosphere, let me say how good it is to be at this stage. An illness knocked me down over the past six days, and I’ve spent very little quality time out of my bed. However, after two doctor’s visits and handfuls of prescription meds, I’m so grateful to feel human again, and, barring any setbacks, will return to school tomorrow (Wednesday). I haven’t taught since Tuesday of last week. I posted a photo of my studio as it looked when I abandoned it last week. I wish I could say that I am painting today, but I am not. However, I am reading once again, and loving it. It’s so good to be able to focus my eyes again. I guess I’m just feeling too weak to paint, to concentrate that intensely. But I’ll get there. I have the itch, no doubt. I posted the De Kooning quote in amusement. At this point, I wouldn’t mind being stiff and upright. I think I’ll do better art work when I reach that posture. Thanks for reading. Back soon. God will not have his work made manifest by cowards. Yes, I read this excellent book, Art and Fear, by David Bayles and Ted Orland. I felt that a pair of artists were in the room with me, engaged in legitimate, heart-to-heart discussion. And they addressed the inherent fears and required courage of art making rather than the blocked-artist syndrome. I am not a blocked artist. I am a public school teacher, teaching multiple subjects. I will frequently face weekday afternoons and evenings where preparations leave little-to-no time for quality studio work. 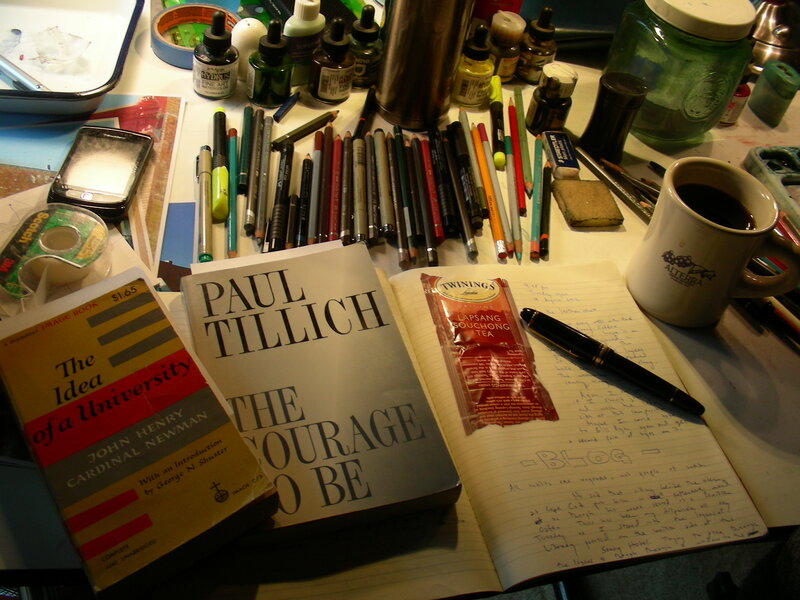 But that is not blockage, not creative paralysis–it is just an overloaded schedule. This afternoon I managed to eke out some time for the studio, so here I am, with a little hesitation. So what is this “fear” factor? I will be the first to testify that making art is a courageous act. Art requires more courage from me than other acts that might stir up fear in others. For instance, I am not afraid to walk into a high school classroom, stand in front, and begin talking directly to the body of students. I have never been afraid to stand in a public auditorium and address a congregation of adults. I don’t know fear in those instances. But what is this “fear factor” in art? Am I afraid of rejection by the public? Not really. Do I fear ruining a $20 sheet of quality watercolor paper? I don’t think so. Am I afraid I am wasting my time? Hardly. I have invested years in this, and don’t begrudge additional hours, days, months or years. In fact, I wish I had 500 years left to invest–I’ll never reach the level I want to reach in my own lifetime. So, what is it? Am I afraid of making a bad painting? Perhaps that is it. But I don’t understand that. When I make a bad painting, I just don’t show it. I seldom throw bad painting attempts away. I suppose that if I keep them in a drawer that I’ll take them out another day, study them, and learn from the mistakes. But I don’t generally do that either. I just don’t look at them. So what is it that frightens me? What is the source of the anxiety? I wish I knew. Somehow, I am intimidated, approaching subjects where I have little-to-no experience. And that is what is happening now with the rendering of human figures in watercolor, small human figures. I don’t know why I have this phobia about screwing up. So what if I screw up? This is laughable. I don’t live financially off my art sales. My job keeps me fed and housed. Maybe at the root of all these art endeavors is the fear of failure. But how could that be? How can one fail, if allowed to re-do, re-try, if allowed to learn, grow, accomplish? Silly, isn’t it. Perhaps I need to re-read Rollo May’s The Courage to Create. 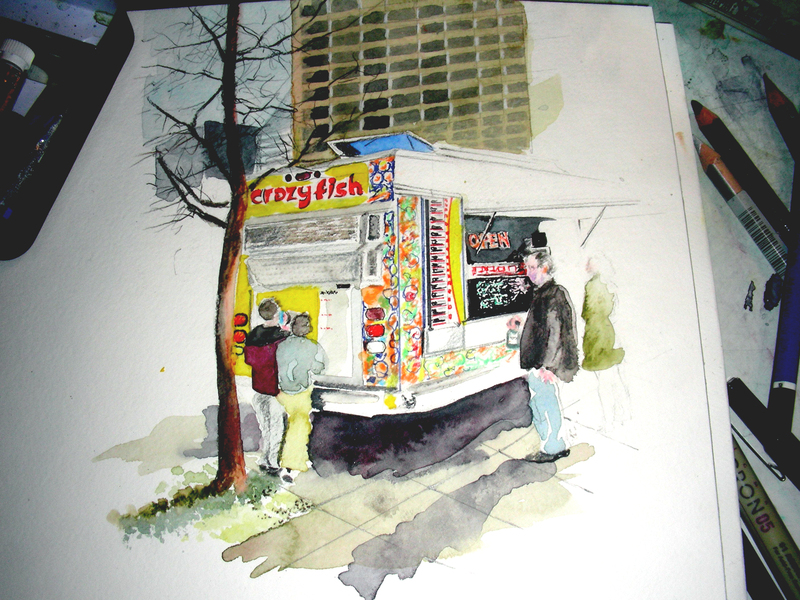 At any rate, I am in the studio for a short while this afternoon, nibbling away at this small watercolor sketch. And writing this blog is therapeutic it seems. Right now, I am not afraid. In fact, I’m enjoying the process, regardless of the outcome. And when I finish this one, I will turn to the next. One cannot help but improve with practice, and practice on the human figure is something I have yet to accomplish. Thanks for reading. Thanks for putting up with my navel gazing (smiling). I had some things to work out. Who cares what sensibility or discrimination a man has at some time shown, if he falls asleep in his chair? . . . Of what use is genius, if the organ is too convex or too concave and cannot find a focal distance within the actual horizon of human life? This statement from Emerson knocked the wind out of me this afternoon (oops, yesterday afternoon–midnight has already arrived) when I was closing out one of my classes and thinking about my recent reduced watercolor and sketching output. Too often I use my job as an excuse, but frankly I’ve been able to average over a hundred watercolors a year for several years in a row now. So it has to be something else. Inspiration has been on the flat side. But when I read this Emerson statement from “Experience” (a fabulous essay that I hadn’t read in over ten years) I was reminded of something I read last year from Ian Roberts in Creative Authenticity, namely that no one cares how much talent you have if you’re not creating anything. Good point. 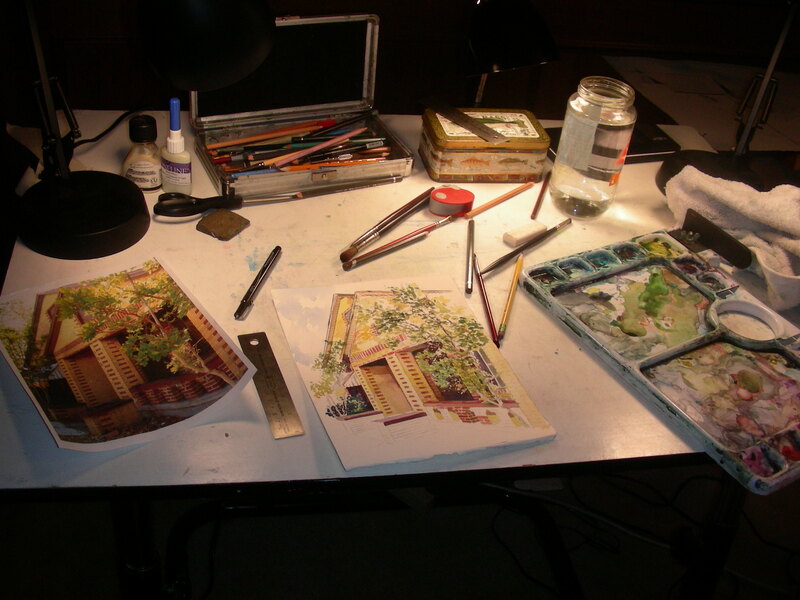 I’m glad that I spent the better part of this past evening working at my drafting table. It’s a good feeling, being a part of something much larger than my individual self. Walt Whitman, “O Me! O Life! The watercolor sketch above is something I started a couple of months ago and then abandoned as other projects crowded in. A former student of mine, Mike Catlin, is now managing Bowman Design and Framing in Portland, Texas, near Corpus Christi. He invited me into that gallery last year, and I traveled down there in November to deliver some of my work. We spent a couple of days together, renewing an old friendship, then traveled about the coast to take pictures for future sketches and paintings. 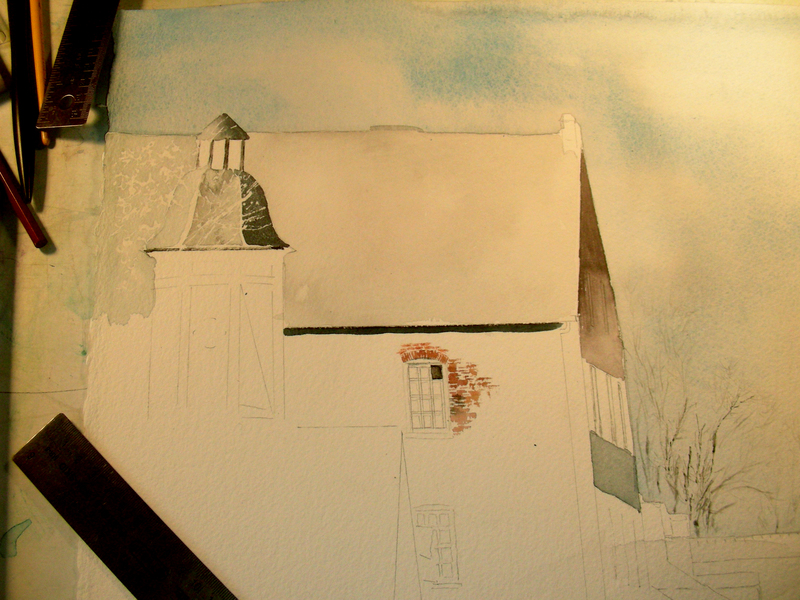 I got after this 8 x 10” watercolor rather quickly, but then stalled. So I’m now trying to breathe life back into it–something I always find hard to do when I’ve let a piece lie about and get cold for awhile. I took several dozen photos of old bait shops in that area, and really like the compositions of some of them. I just need to put my head down now and get some of them kicked out. Soon, I will be leading a watercolor workshop for that gallery, and I would really like to get some paintings together of the area before I show up for the sessions. Thank you, Mike, for helping me get untracked again. And thanks to the rest of you for reading me. This morning, driving through the icy darkness to school, I slid Dave Brubeck’s CD into my dashboard player and felt warm amusement as Blue Rondo A La Turk played. I don’t know how to discuss music on an academic level, but I’ll simply say this–at the 1:53 mark, this piece finally settles into a pleasant 4/4 swing groove, only to be repeatedly interrupted by the spastic staccato that opened the first minute and a half. And the more I replayed it, the more I laughed in the darkness and enjoyed it. Forgive this unschooled application of Brubeck’s piece, but the longer I thought on it today, the more I saw how it fit life as I experience it daily. I can safely say that my daily round of work routine involves a series of comfortable, flowing grooves, punctuated with intermittent surprises. If I can ride the rough surf of the surprise, the groove will follow shortly. I can usually count on that. This is true of every class, every passing period, and every evening once I arrive home and begin my nightly routine–interstices consisting of grooves and spazzes. That is how I view life. And yes, I acknowledge that the perspective is colored by my own peculiar lenses. Dream delivers us to dream, and there is no end to illusion. Life is a train of moods like a string of beads, and as we pass through them they prove to be many-colored lenses which paint the world their own hue, and each shows only what lies in its focus. But enough about moods. Let’s talk about art . . .
Again, I find myself lost in an evolving sketch. I am grateful for the warm memories of that Saturday afternoon in Dallas, especially now with the night around me dropping to 29 degrees with freezing rain. I am still poking at this sketch, unsure of how to make the warm yellows and oranges pop against the atmospheric surroundings I found that afternoon. The sun from the right was very intense, and I loved the effects of it. 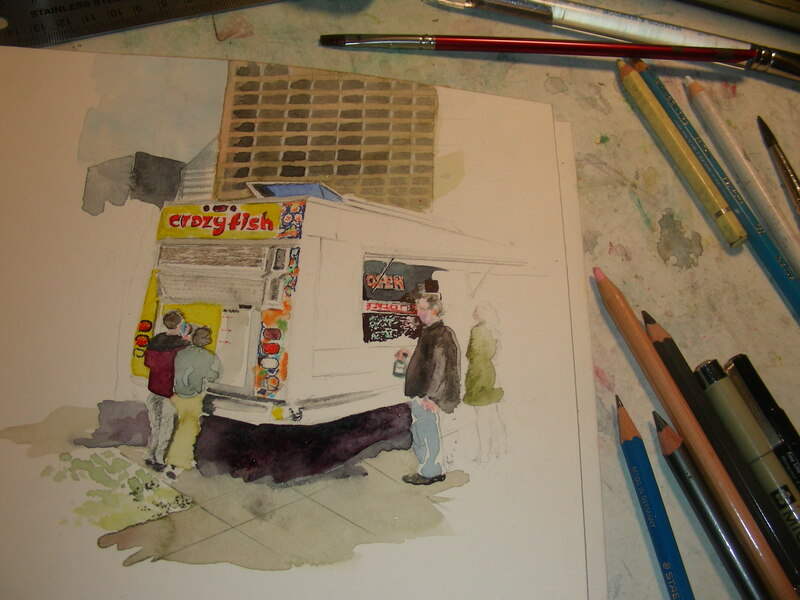 I’m still wondering if I should try and get that on this page, or just focus on the people I’m trying to render and the decorations on the side of the food truck. As I work, I’m listening to some very old VHS tapes of Joseph Campbell lecturing on James Joyce. I love the work of Joyce, and love Robert Motherwell’s assessment of him as the Shakespeare of Modernism. Motherwell said that the work of Joyce made him want to paint. I can say that listening to Campbell’s fireside chats on this cold night have stirred my blood, helping me get back to the brush. There are always sunsets, and there is always genius; but only a few hours so serene that we can relish nature or criticism. We wake and find ourselves on a stair; there are stairs below us, which we seem to have ascended; there are stairs above us, many a one, which go upward and out of sight. But the Genius which according to the old belief stands at the door by which we enter, and gives us the lethe to drink, that we may tell no tales, mixed the cup too strongly, and we cannot shake off the lethargy now at noonday. . . . We are like millers on the lower levels of a stream, when the factories above them have exhausted the water. We too fancy that the upper people must have raised their dams. I awoke this morning, feeling rather dull and sluggish. There was no real reason for that–I didn’t exactly overdo it yesterday, and thought I had gotten plenty of sleep. I rose from bed anyway, chalking it up to “aging” and tried to smile about it. I made coffee and sunk into a comfortable chair to cozy up with words from Emerson. It was Sunday, and I needed a Good Word. He didn’t disappoint. The selection I posted above came from an Emerson who felt his creative spirit sagging after years of explosive thinking and writing. And with genuine wisdom, he addressed that sobering feeling of creativity leveling off. For years I have been conscious of the ebb and flow of a creative life, and have tried not to let the barren stretches bring me down. There are many ways to re-tool, to refresh, to trim one’s sails to catch the breezes once they blow again. And so, when I read the above passage, I laughed out loud, shook off my doldrums, and set about the task of getting tomorrow’s classes ready for school so I could pick up the brush again. I have been so timid about rendering people in watercolor. Figure drawing has always been difficult for me, and trying to render humans in watercolor even more intimidating. But as I viewed the Edward Hopper collection over the past couple of months, I realize that some of his small renderings of people in watercolor and charcoal were not all that splendid. So, I’ve decided I’m going to go after this subject and see if I can pull it off. If I cannot do it with this one, I’ll do it with the next, or the next. I’ll get it. 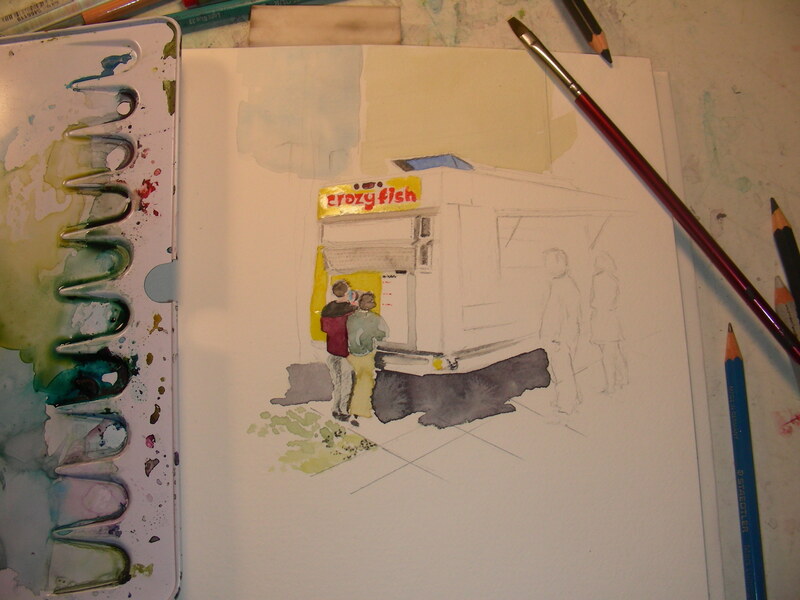 I’m starting with a small, modest-sized watercolor sketch, to see how I do with people. And I’m intrigued by this new direction, not tired (wink).